Capsule Summary: Fed up with liver and fish, Hawkeye goes to extreme lengths to get a shipment of ribs from Chicago delivered to the 4077th. “Adam’s Ribs” is unquestionably a classic. It includes an iconic rant from Hawkeye and has led countless fans (and probably some casual viewers) to wonder whether there was or is a real restaurant in Chicago called Adam’s Ribs. More on that later. Hawkeye’s “a river of liver and an ocean of fish” rant is easily one of the most famous lines from all of M*A*S*H, a superb piece of writing flawlessly delivered by Alan Alda. My favorite part of the scene is either Hawkeye’s little dance or him climbing the tent pole. Is it plausible that Hawkeye would be able to set in motion just the right chain of events to actually get ribs shipped from Chicago to Korea? Not really, no. Is it even possible that the ribs would still be edible after arriving at the 4077th? I doubt it. In an episode like this, none of that matters. In my opinion, one of the big reasons that this episode works so well is the absence of Frank and Margaret (and Father Mulcahy, for that matter). Although it’s likely one or more of these characters could have added something amusing, them not being in the episode gave Hawkeye so much more time to shine. The end of the episode is somewhat depressing. One certainly hopes that Hawkeye was able to return to his ribs after surgery but even if he did they would be cold. It reminds me of the ending to the iconic “Time Enough at Last” episode of The Twilight Zone. Poor Hawkeye. It’s just not fair. There was no restaurant called Adam’s Ribs in Chicago around the time of the Korean War. Nor did scriptwriter Laurence Marks or executive producer Larry Gelbart base the fictional Adam’s Ribs on a real restaurant. According to a June 1996 post to the alt.tv.mash newsgroup, Gelbart came up with the name because he was from Chicago and his newborn son was coincidentally named Adam. A cultural historian for the Chicago Department of Cultural Affairs explains in the article that anyone intimately familiar with Chicago would know that Adam’s Ribs as described in the episode couldn’t exist. That hasn’t stopped fans from trying to find it, however. If Henry knew Chicago and Dearborn Station so well, why wasn’t there someone he could call to pick up the ribs? Assuming, of course, that he wanted to help Hawkeye. Hawkeye refers to himself as Cranston Lamont while talking to Bernard Reznik at Dearborn Station. Lamont Cranston is the alter ego of the crime fighting protagonist of The Shadow radio show. Basil Hoffman, who plays Major Pfiefer, would later guest star in “C*A*V*E” as Major Bartruff. “‘Adam’s Ribs’ is unquestionably a classic.” Nothing more needs to be said. I always assumed the restaurant was named Adam’s Ribs as a clever little nod to the Book of Genesis, and God having created Eve from one of Adam’s ribs. 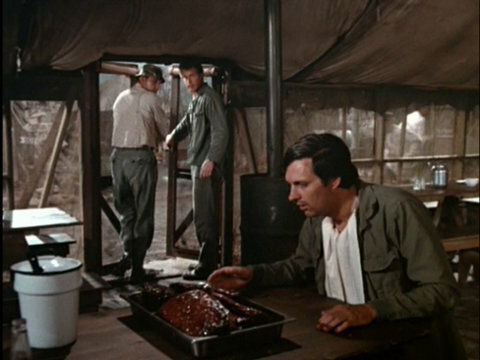 Adam’s Ribs is very much in my top 5 (perhaps even my #1) episodes of M*A*S*H.
I love the scene in Henry’s office when the skeleton causes Hawkeye to realize what he really needs to eat is Adam’s Ribs. The dialog that takes place between Henry, Trapper, and Hawkeye in that scene leaves me in stictches everytime. I agree with your question about why Henry wouldn’t have any contacts in Chicago, especially with Illinois being his home state. …another observation .. at the very beginning of this episode is a quick outdoor shot of the 4077 and a group of 3-4 people can be scene dancing/clogging(?) on a wooden platform. I have noticed this particular scene pops up in at least 1 or 2 other episodes. I wonder if there is a story behind that particular shot, or if it was merely a coincidence that it was picked as an establishing shot in more than one episode? I’ve noticed that too, never understood it, lol. It always looked to me like they were trying to do the can-can. I guess when there’s nothing to do at the 4077th, they’ll do anything to fight boredom. Easily in my top 10 favorite episodes. Just a good, solid funny episode of M*A*S*H, purely entertaining from start to finish. There are TONS of great lines here. I can’t see ribs nowadays without exclaiming “Barbecued spare ribs! That’s what I want, that’s what I need!” No coleslaw? “Forgive us, we’re draftees” (or modified appropriately if someone else has forgotten the coleslaw). I love Hawkeye’s protesting when the choppers come at the end and they have to leave the ribs behind: “WE LIED TO MILDRED!” The mess tent tantrum is a riot, as is Hawkeye and Trapper trying to get the ribs out of storage via proclaiming a fake illness in the vicinity: “Definite slurring of the “S,” followed by the eyes blinking in an up and down motion.” I love it! I could go on and on about this one. A genuine classic! I’ll go you one better, Larry: I can’t eat ribs nowadays without playing this episode as I do so. Yeah, I can’t eat ribs without at least thinking about this episode. Frank and Margaret are conspicuously absent in “Adam’s Ribs”…I wonder why? One of my favorites and, along with “Big Mac,” one of the very best episodes for pure laughs. Well, I guess I’ll be devil’s advocate here. I hate this episode. Absolutely hate it. The plot is so improbable as to abandon reality and enter the realm of fancy; more like some GI’s pipe dream than an actual occurrence (in fact, had the episode ended with Hawkeye waking up to find it was only a dream, and shuffling off to the mess tent for more liver and fish, I’d have liked it better). Hawkeye’s sudden obsession with these ribs is irritating rather than amusing; and nowhere in the series, other than this episode, is there any indication he has any connection to Chicago. And why everyone goes along with his ludicrous scheme is perplexing. Now, oddly, we know less about Hawkeye’s background than any other major character, except, perhaps, Margaret. He was raised in Crabapple Cove, Maine; has a sister; his father is 62, a pediatrician, and, in most episodes, a widower (in one episode he ends a letter, or phone call, with “give my love to mom and sis”); other than a couple of vignettes from childhood, that’s about it. So, through mere conjecture, we could rationalize his intimate knowledge of Chicago as due to his attending college and/or med school there. But then we have the incongruity of another episode in which someone has a toothache and Hawkeye states, “give me a two week pass and I’ll take him to my dentist in Detroit” ….???…. Why would Hawkeye’s dentist be in Detroit? This is one of the few episodes I never watch. Wonder if Hawkeye would have settled for spam bits in the Adams Ribs sauce? Would have been cheaper and easier logistically to just order a container of the sauce. Regarding the edibility of the ribs after the long journey, Hawkeye specifically tells the person at Adam’s Ribs not to cook them, but to package them. This should mean that the restaurant would either keep them in the freezer until Mildred picked them up, or better yet, pack them in dry ice. Also, Trapper tells Radar to put “Keep Refrigerated” in the wire to the military transport service. I suppose the show could have gone into more detail, but there’s only so much time in an episode. Why was Klinger seated at the table when the ribs were served? He refused to help Hawkeye with getting the ribs to Korea. I wouldn’t have given him anything! If this episode had been made in a later season, everyone in the camp would have barged into the mess tent demanding to get a rib. saying oh no no no! baby! no no! yeah he haved the chance to eat ribs! but he didn’t! poor hawkeye! same feeling for trapper radar mulcahy and henry! Just watched this episode again! It is, by far, my favorite. I don’t care if it’s improbable… It’s fun, moving, emotional, exciting as I wonder every time if Radar will get Sparky to patch him through and if Bernard Reznik will look up the number of Adam’s Ribs and will Mildred really pick them up and get them over to the MPs at Midway? Even knowing the end of the story, I love it and laugh through the whole thing every time. “A river of liver and an ocean of fish!” What a great line! I can’t look at the name Bernard Reznik and not immediately think about the character name in the film the Machinist ‘Trevor Reznik’, played by Christian Bale! As makers of the Machinist have explained, ‘Reznik’ in this case is inspired by Nine Inch Nails’ frontman Trent Reznor…. Oddly enough I had an Elementary school teacher named Resnick…I think of her whenever I see that scene. Hey, all! Today, my dad bought some ribs from the store so I can use them to make the “Adam’s Ribs” recipe from the MASH cookbook that Jeff Maxwell wrote, which was a Christmas gift this year. My 19th birthday is on Monday, so that’s when I’ll be eating them, along with Father Mulcahy’s cream corn from “War From All Seasons” and MASHed potatoes! We also ordered a birthday cake with a pic of the cast of printed on it. We’re also going to watch “Nurse Doctor”, my favorite episode, and perhaps even “Rally ‘Round the Flagg” or “Movie Tonight”. I wanted to wish you a MASH-tastic 19th birthday!!! I’m so proud of you.